Starting a business is easy. Making it a successful manufacturing business is a bit more difficult. Bringing a completely new brand, in a highly competitive sector to a completely new market with a goal of turning it into a £100m business in five years? That’s a whole different challenge. Calbee UK has a recipe not only for a unique product, but for success as well. Real determination is blended with self-belief before a large dollop of commitment is folded in, then a dash of bravery is added, with unshakeable faith in the product to top. Making success a reality needs a dedicated team of like-minded people and partners with whom you can share your vision, values and goals and it’s from that starting point that Calbee UK began its journey in August 2014. A year later, the ‘Yushoi’ brand had been launched, a state-of-the-art factory refitted and production line built and tested, administration and production colleagues recruited, full production had begun, and the first orders had been processed and shipped (on time, and in full). Clearly, Calbee UK are doing something special, with big plans. They’re growing rapidly and ramping up production for new, bigger orders, but that was still just the start of things, and we have been fortunate to share the journey from day one. From small beginnings providing the managing director’s laptop and the first Calbee UK email address, the Waterstons partnership with them has grown in scope and in strength. From the earliest discussions, it was clear that Calbee’s values very closely mirror our own. Empowering and respecting colleagues, engendering a spirit of innovation, delivering exceptional quality as a team; all shared goals and aspirations of both parties. Calbee delivers to their customers a unique, high-quality product, and they aspire to positively influence the lives of their colleagues and consumers alike. Every Calbee colleague plays their part in delivering on these aspirations and supporting the growth of the market in healthier savoury snacks. In the same vein, our people all play a role in delivering on our vision to help our customers do better business through IT that delivers genuine value. We don’t have a box to sell, or ‘an app for that’. We have a team of individuals, working as one to deliver complex projects alongside our customers. To us, no two customers or projects are the same but the way in which we work with our clients never changes. We build strong relationships and work with people rather than just for them. We always put our customers’ needs before our own and that’s why they trust us. We don’t often get the chance to help build a business from scratch but when Calbee UK came to us we knew our partnership with them would be exciting, challenging, scary and completely brilliant. Whenever we sat down with them in the early days their passion and enthusiasm was obvious, and infectious (and still is today) – their values go beyond words and are something they live and breathe every minute of every day. They didn’t need to ask twice! With a goal of being recognised as an exceptional employer whose colleagues’ work-life balance is a key consideration, we knew ‘traditional’ IT wouldn’t be the best fit. We needed to come up with a cost-effective, scalable way to free Calbee UK from fixed locations and working hours; to provide the best possible mechanisms through which to communicate and to work together in teams. Calbee UK never told us what solution they wanted us to deliver; we asked them what they want to achieve, and they trusted us to always do the right thing. Knowing that significant growth was inevitable, we proposed a blueprint for their IT services which could be scaled up to accommodate increasing user numbers; rapidly deployed to new factories and offices without disruption to services and without significant additional investment. Leveraging public and partner cloud services together, Calbee colleagues carry their office with them in their laptop bag. Waterstons’ hosting services support Microsoft Skype for Business in taking care of phone calls, video conferencing, file sharing and messaging. Microsoft Office 365 provides key business tools for the user including SharePoint and Office applications. Our 24/7 monitoring keeps things running smoothly but if things do go wrong our service desk is only a phone call away. Calbee UK are a forward-looking organisation so when it came to choosing a system to support their operation, they didn’t want a short term solution. In late 2014, we proposed a selection exercise to choose an appropriate ERP product which was immediately started, but this wasn’t an ordinary procurement. For a start, how do you choose a product to support your business process when a process doesn’t exist? Who makes up the project team for an ERP implementation when the business only has three people? Once again, our partnership held the answer. Our experience and expertise in the food and beverage sector, and our history of working with key members of the Calbee UK team meant we were able to step into the customer’s role. Without a project team of process experts from Calbee UK, we set about defining process and requirements for their ERP system based on our knowledge of best-practice in the industry. A selection was duly made, and the first phase of the ERP solution and finance product got underway. By the time implementation began in February 2015 Calbee’s interim colleagues, who were engaged in getting the factory and production line designed, built and tested, were able to begin validating some of the process. Three months later, in May 2015, the first product came off the production line, with traceability, stock control, purchasing and finance capability all supported by the newly implemented ERP system. 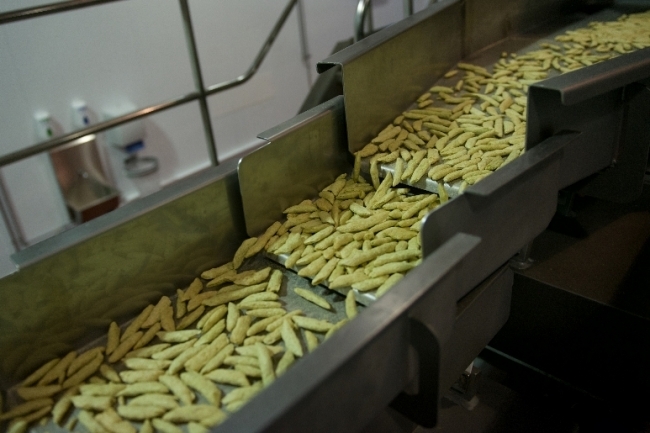 By mid-July, the first official order was produced, packed and ready to be dispatched; quite an achievement when you consider the complexity of fitting out and commissioning a food factory just in itself, let alone doing so in around six months. 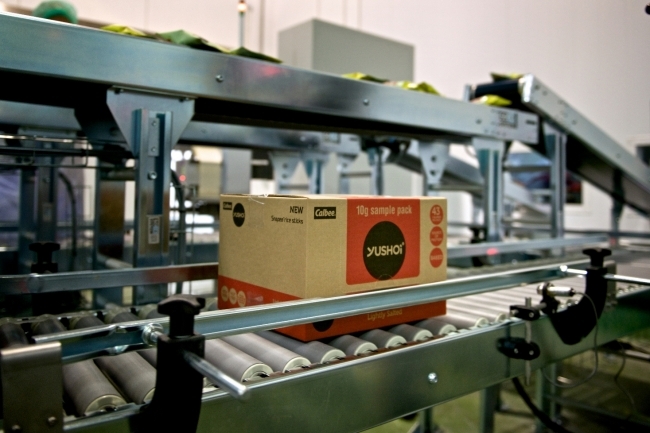 Since then, production has continued, orders have been placed and fulfilled and Yushoi Snapea Rice Sticks have appeared on retailers’ shelves throughout the country. As we approached the end of the first full year of Calbee UK’s existence, the journey continued with enhancements to the ERP system, the setup of EDI trading relationships with new customers, and developments to refine and enhance business process. For us at Waterstons, working with Calbee UK continues to present unique challenges, but their single-minded focus on achieving excellence in quality, alongside a culture of empowerment and all whilst maximising the value of and return from all of their investment, makes the journey every bit as exciting and enjoyable as we thought it would be. We are privileged to stand alongside them.